After a six-post review of an advanced design course, we now return to our current inquiry into the relation between designing and implementing in permaculture. A core idea integral to how permaculture design process is understood and communicated in the permaculture literature is that of completing a design to some satisfactory degree of detail and only then implementing it. Part 3 interviewed an acorn who showed us that nature doesn’t roll this way – which is to say that permaculture design process doesn’t mimic the processes living systems use to create themselves, even thought it is supposedly about mimicking living systems. Part 4 shared a taste of Christopher Alexander’s powerful critique of the conventional architectural practice of detailing a design before implementing it. This a striking internal contradiction within permaculture. Evidently thousands of people are being taught an approach to permaculture design (based on what is in the books) that some of the most considerate permaculture design thinkers in the world reject on the grounds that it doesn’t work! Part 7 left the confines of permaculture-world to discover a highly relevant parallel discussion on wikipedia’s design entry contrasting rational and action-centric design approaches. In at least one important respect,2 many modern software designers are using design processes that are more sophisticated, more throughly researched and crash tested, more adaptive, and in some ways even more nature mimicking than the processes used (or at least publicly taught and communicated) by permaculture designers, who ostensibly are all about mimicking nature! Part 9 summarised our discoveries and got ready to try them out on the ground. Along the way there has been some fantastic conversation and commentary (see for instance here, here, here, and here for a few personal highlights). 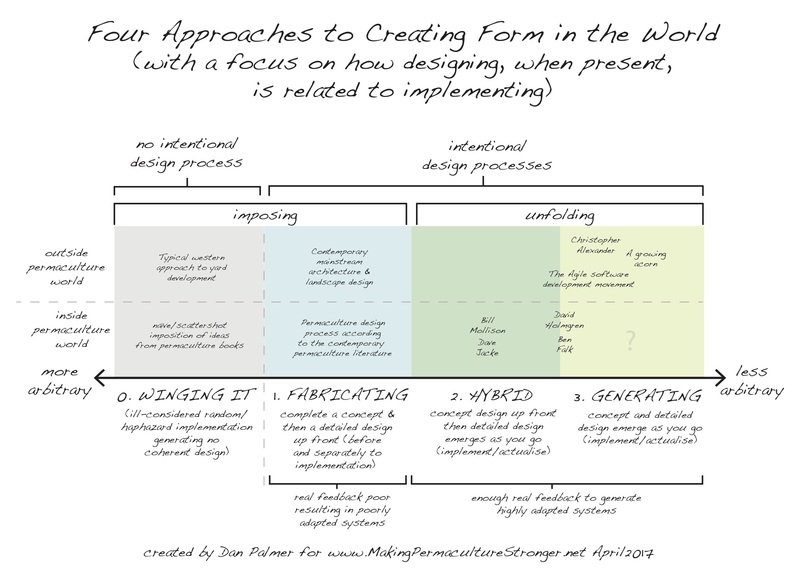 In the next post I’ll get on and start sharing a clear permaculture design example of a hybrid process. I hope to catch you again then. I stress I’m talking about just one important respect here. Thanks Aaron and yeah I am in touch with Nikos’ colleague Michael Mehaffy and the books they have collaboratively authored, but look forward to checking out the youtube. Thanks Dan for yet another important piece. We developed what we’ve called “Our Works Pattern” in the mid 90’s as we were getting busier and needed a stronger workflow. Perhaps interestingly the biggest influence to us developing this pathway was not from within the design professions but from the great book, “The E-Myth” (Gerber, 1993), as it looked at the franchise prototype and applying a systems based approach to various processes and workflows in any business — using the McDonalds restaurant chain as its main example. 1. Holistic Context Completion & Boundary Reference – Client Completes – 2+ hours – A. Obtain a copy of the 1. Climate chapter of the Regrarians eHandbook, B. Read sections 1.09—1.11 (pp.25-29), C. Complete the 1. Climate checklist (Appendix 3 pp.68-70) D. Create a boundary map in GoogleEarth of the project area and send it to us as a .kmz file. Our current 10 week REX Online Farm Planning Program is based on the ‘Regrarians Works Pattern’ with the intention being that participants are involved in a participatory design process where we facilitate them to develop their own farm plans. Since it was incepted in 2012 the Regrarians Platform (‘RP’) has provided a large number of people with a planning process that is holistic, inclusive and thorough. Its 10 layers are based on the 8 factor ’Keyline® Scale of Permanence’ that the renowned P.A. Yeomans outlined in 1958 and forms the basis to all of Regrarians Ltd. trainings, farm planning consultancies and media outreach. A RP farm plan is not just a design on a map — its a detailed and holistic process that brings together the contexts of an individual, their family, their team and their community with that of the climate and the landscape and region they’re operating in. A primary step in the Regrarians approach to farm planning is to use Keyline Geographic Analysis to understanding the principal landscape elements. Once established these elements inform the placement of most of the design features that make up the Development layers of the Regrarians Platform. Using the Keyline Geographic Analysis is at once liberating and powerful as the landscape ‘speaks to you’ (P.A. Yeomans), ‘telling’ you where to put different elements such as water, road, tree, building and fencing systems. The Regrarians Platform (RP) process is holistic and therefore thorough. The RP Checklist that goes provides an ‘A-Z’ list of points to consider when formulating a farm plan that will work for you and puts you and your landscape at the centre of the process. At this stage of the farm planning process you should have a good idea of what development-based elements should be placed on the farm map. From our perspective its a strong case of “less being more” — whereby planning is focussed on what is needed in the short to medium term though with an eye to future plans and capacity. Typically concept plans will focus on the ‘development layers’ of Water, Access, Forestry, Buildings and Fencing. This might involve planning water storages and a network of pipes, designing some farm roads, orchards and shelter belts, placing farm buildings, the homestead grid of fencing. Over the course of the last eight weeks you will now have a very sound idea of your Holistic Context and how this is reflected in the development and management of your farm through your concept plan. Now its the time to be ‘Strategic, Pragmatic & Incremental’ — zoom into the planning work you’ve done so far as you look to take the next steps and actualise what you’ve planned. The testing decisions in the ‘Holistic Management Framework’ for decision making will help guide you to what do and what not to do, and when. Does your project need a big ‘D’ development approach or is it a big ‘M’ management approach that’s best for you (or vice versa) ? This is the time to look at deciding which levers you should pull. Our last week! Do you still have more questions than answers or are you completely ready to dive in? Each of you will be at different stages in where you are at right now. We get that. This week is all about you using the time to open right up about what’s holding you back and where to next and how the Regrarians® Workplace can help you. Regenerative Agriculture is not just about building a new farm, its also about building new communities and continued professional development. The Regrarians® Workplace can help you in a lot of ways so that you are not alone out there and that farm by farm, acre by acre we build the world that we all know is possible when we put our minds and hands and hearts to the task. Thanks Darren and as you know I have huge respect for your work in design process innovation over the last several decades (hence this post) and gratitude for the important (ongoing) contribution it has made to my own. One thing I didn’t know was the role the E-Myth book had on the early development of what has culminated in the Regrarians Platform! Yeomans meets Gerber ;-). Anyways I appreciate your dropping by and I’ll be hassling you soon about probing your thoughts about this stuff for a podcast.